Sergeant Jack Coleman Cook of the 384th Bomb Group of the 8th Air Force in WWII was Delia Cook McBride’s uncle. Delia never had the chance to meet her mother’s brother because he died in WWII. 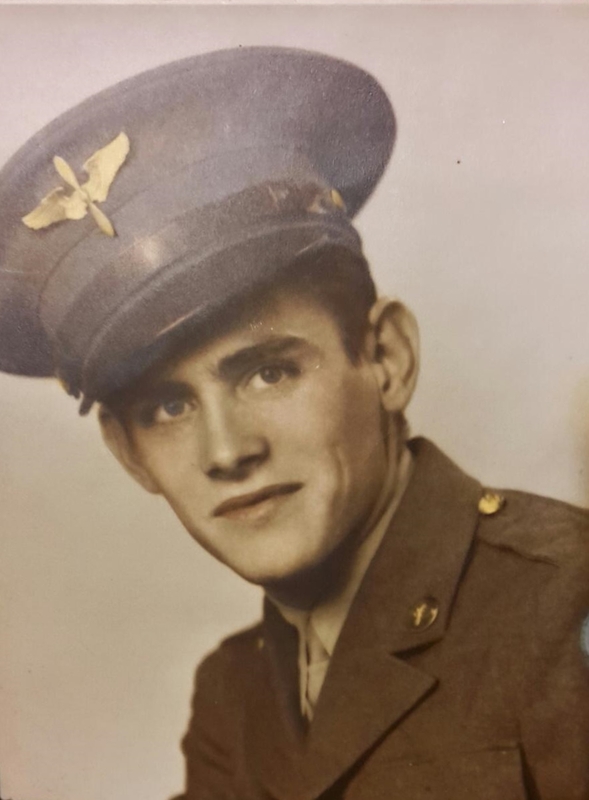 He was a family legend, only known to her through the memories of her family and the scrapbook her grandmother made with photos, newspaper articles, and letters. The scrapbook was the last connection Jack’s mother, Mary Ellen Cook, had to her son. Like so many others, Jack went off to war and never came back. In my lengthy research of Jack Cook, I had two main questions surrounding his death. One, did Jack receive any awards recognizing his actions on February 3, 1945 when his shot-up B-17, the Challenger, was forced to ditch in the North Sea? Jack’s pesonnel record was burned in the big fire at the National Personnel Records Center (NPRC) in 1973, leaving no record of any awards. The crew had to swim for life rafts, and three of the crewmen did not reach any of the rafts. 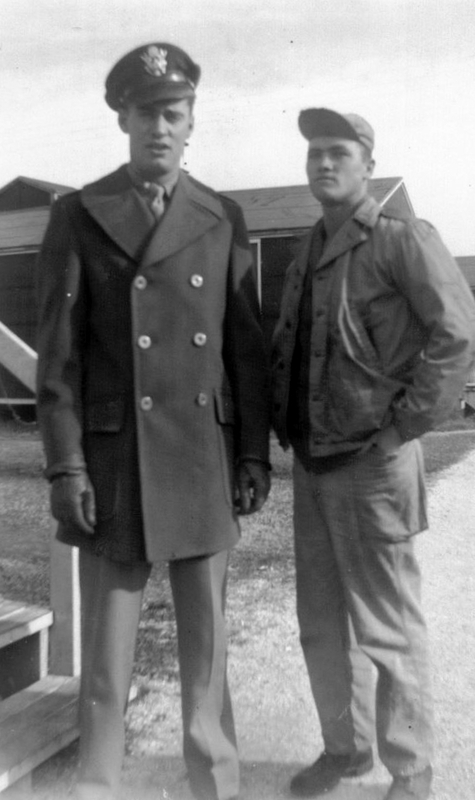 These three crew members were the pilot, Second Lieutenant Robert C. Long, the radio operator, Sergeant Fred A. Maki and your son. The bodies of your son and the pilot were recovered. Was this all that the Cook family knew about the ditching? They were led to believe that Jack died in the North Sea without ever reaching a life raft. Did Jack’s parents go through their entire lives without knowing of Jack’s heroism? Finding Jack’s niece, Delia, and Mary Ellen Cook’s scrapbook led to the answers. Many newspaper articles reside in the Cook family scrapbook, and though they are old and yellowed, play their part in keeping Jack’s memory alive. Most of them report the same story of the sad day when Jack lost his life in the North Sea, how Jack, fearing the life raft overcrowded with most of the crew would capsize, got into the North Sea and maneuvered it “acting as a human propeller” to come alongside the raft containing the unresponsive pilot. Most of the newspaper stories were likely written from the Stars and Stripes account of the ditching of the Challenger on February 3, 1945. None of them mention specifically that Jack Coleman Cook gave his place in the life raft to Edward Field, but some do note that Jack rescued another member of the crew, likely a reference to Jack’s trading places in the water with Edward. 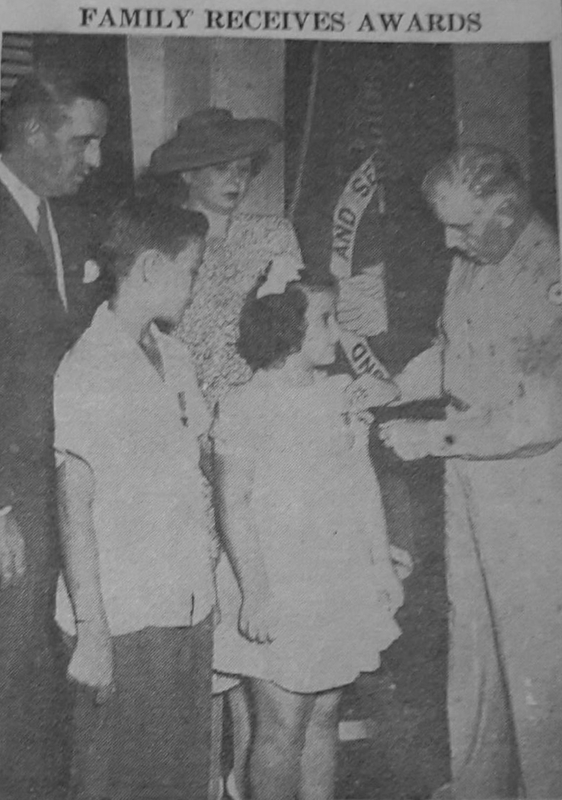 Col. John P. Wheeler, commandant of the Army Redistribution Station, is presenting Princella Cook the Air Medal, awarded posthumously last week to her brother, Sgt. Jack Cook, U.S. Army Air Forces, as her parents, Mr. and Mrs. W. Prince Cook, and brother, Prince Cook, Jr., look on. The latter is wearing the Bronze Star medal presented at the same ceremony as a posthumous award to Sergeant Cook. 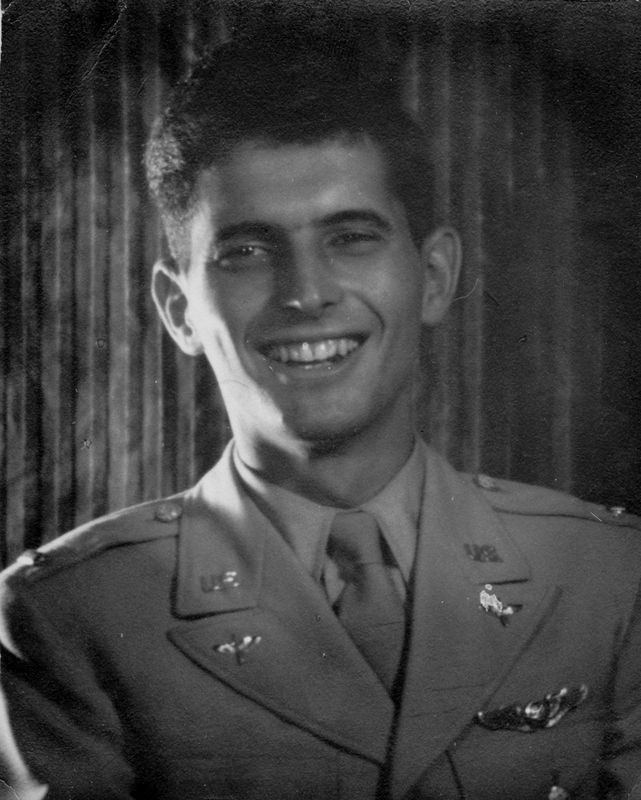 The young airman, ball turret gunner on a B-17, died of exposure in the icy waters of the North Sea where his plane crashed February 3. He was cited for his courage and heroism in rescuing another member of the crew and in making himself a human propeller to keep rafts holding the remainder of the crew together until a rescue craft arrived. This action won him the Bronze Star award. The Air Medal was for meritorious action in raids over enemy territory from January 29, 1945 to February 3. But it was the family of pilot Robert Long who likely were the Cook family’s original source of the news of Jack’s bravery on February 3, 1945. 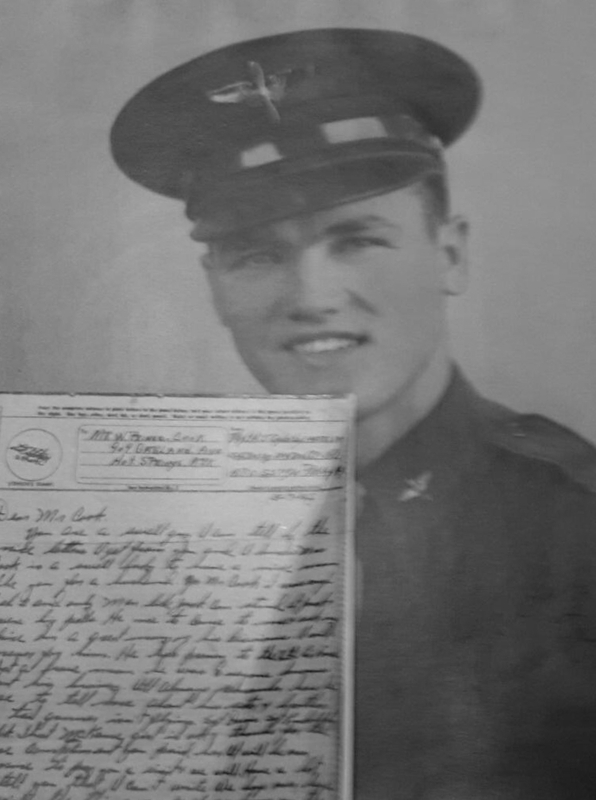 In their letter to Mr. and Mrs. Cook, the parents of Lt. Long said their son had sent them the address of every member of his crew. They were not certain that Mr. and Mrs. Cook had learned details of their son’s death, so forwarded them the newspaper clipping. Until its receipt, Mr. and Mrs. Cook had not received any detailed information from the government. Another important source of information for Jack’s parents was Jack’s crewmate, Howard J. Oglesby, who had survived the ditching. Howard, like Jack, was originally from Memphis, Tennessee. Your son died a hero’s death. He died in an effort to save the other crew members, and did one of the bravest things I’ve ever seen a man do. No doubt by now you have received notice of your son’s death and of the brave way in which he died. I was with him when it happened and I saw him die. Mr. Cook, Jack was a fine boy and everyone thought well of him, and he thought there was no one like you. I know it is very hard to take and you may think this is easy for me to say, but it isn’t, for I have experienced the same thing twice. We will have to look at everything for the best, though it is very hard to do. Mr. Cook, if you only knew about Jack’s death as I do you wouldn’t feel near as bad. He died a hero’s death in a effort to save or trying to save other crew members. He did one of the bravest things I’ve ever seen a man do. That boy had great courage and plenty of it. I will always admire him for his courage and bravery. He did things that no one thought was humanly possible. Mr. Cook it was rough Feb 3 and only men like Jack Cook can stand it. Jack and I were big pals…I will never forget him. Howard also wrote that he would like to pay Prince Cook a visit. Howard stated he had a lot to tell Mr. Cook that he couldn’t write. If Howard did pay Prince Cook a visit, I suppose he told Jack’s father all of the details of their time in the North Sea, the details a father would want to know about the day his son died. Because of Jack Coleman Cook’s heroism and bravery in the February 3, 1945 ditching of the Challenger, the navigator he saved, Edward Field, has enjoyed a long, wonderful life and will turn ninety-four next month. Edward was able to pursue his dream and have a lifelong award-winning career as a poet. 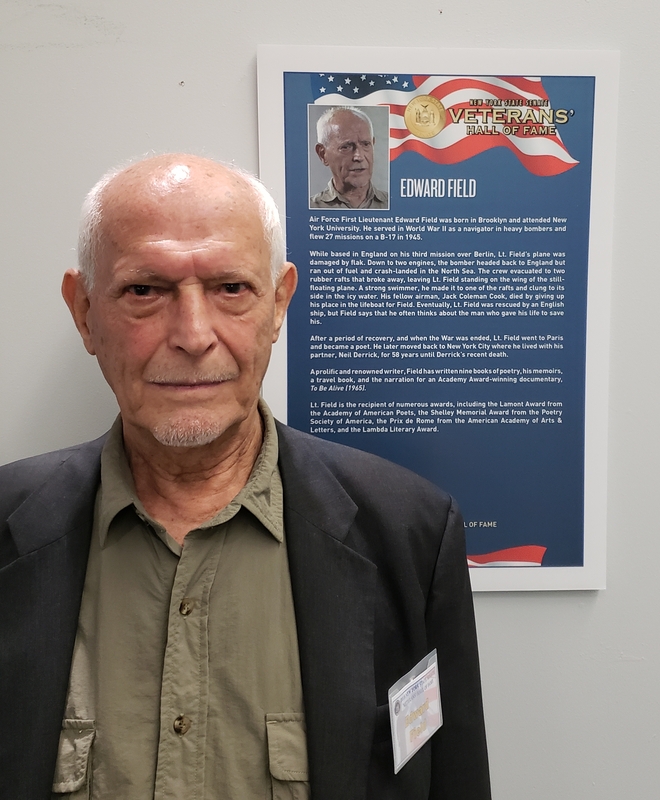 Edward was recently inducted into the New York State Senate Veterans’ Hall of Fame. His Hall of Fame plaque honors the man who gave his life to save Edward, Jack Coleman Cook. Now I know. I know Jack was honored for his bravery and heroism in 1945 and in 2018. I know Jack’s parents learned of their adopted son’s heroic actions and the details of his death on February 3, 1945. But I also know how a family who claimed Jack Coleman Cook as their own for a mere dozen years suffered his loss for very much longer than the time he was part of their lives. Earlier this week on Memorial Day 2018, I remembered Jack Coleman Cook. Like Howard Oglesby and Edward Field, I will never forget him. Jack’s niece Delia plans to have the contents of the family scrapbook scanned and when I receive the scanned images, I will upload them to the 384th Bomb Group’s photo gallery. In the future, be looking for the Jack Coleman Cook collection in the Robert Long crew album courtesy of Delia Cook McBride. Thank you so very much for sharing these family memories with us, Delia. Thank you to 384th Bomb Group researcher and combat data specialist Keith Ellefson for contributing to this article. By thearrowheadclub in 384th Bomb Group on May 30, 2018 . This has been a great story and getting to know what a heroic man my mom’s first husband was !! This has opened up some thing I didn’t know about how Jack Cook had died. Thank for this story!!! Thanks, Jimmy. It has been wonderful to connect with you and other relatives of Jack Coleman Cook.